It was all systems go in Ibiza this past week, with the IMS, new club openings and fresh residencies all taking centre stage. 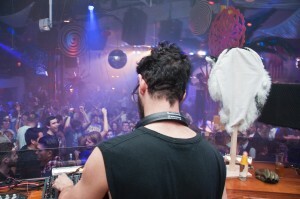 No club on the famous White Isle has brightened up their schedules and overhauled their policies more so than Pacha. Drafting in heavyweight performers such as Solomun and John Digweed to mould with the ever present David Guetta has had the club world all talking – none more so than Guy Gerbers Wisdom of a Glove soiree. Speaking of Guy, the deep house crafts man was on hand all day over at IMS explaining to the media his plans and inspiration for his brand this summer, however for the life of me I still couldn’t make out what made him name the night, if I’m honest I don’t think he could either. However when the night approached after a sweltering day of meetings, Guy was quickly changed into a Freddie Mercury esc garment fitted with glove to match, greeting his fans and supporters who where there. Upon entering through the famous Pacha doors, there was a glass case fitted with a purple glove believed to be worth some serious money. I wouldn’t hazard a guess but it looked rather special. It was an eye opening entrance as there were hypnotic spiral features added to already weird and wonderful club setting matching with the new look DJ booth. Dancers were dressed in what seemed to be in 1920’s style magician and burlesque robes which all married really well with the direction Guy has taken. Moving onto the music, dOP stole the show early doors with a sublime selection live cuts with their pulsating vocals placed perfectly over the top, this in turn carried a punchy beat on the finely tuned sound system. Guy himself stepped up with a deep blend of house which often drifted into a tech house led set. The packed audience added their spin on the opening party of the summer with energy and charisma that the DJ’s really took to. Floating through the crowd you could certainly see everyone was loving what Guy had brought to the table and even more so that the club felt and looked better with the new look booth. Wisdom of a Glove took a early step in creating an experience for the new breed Pacha and a good one at that. It will be interesting to see if the ethos will carry on through all the events but it was certainly a fantastic start. If anyone can keep the energy and happiness flowing then Guy can.